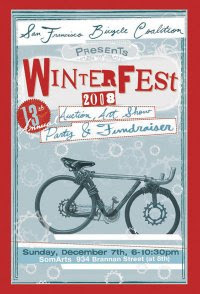 Do not miss the 13th Annual Winterfest SFBC member party, auction, art show and fundraiser. VV will be there, will YOU??? WHEN: Sunday, December 7th from 6-10:30pm. $15/Sliding Scale admission for SFBC Members. * A sense of fulfillment knowing you are supporting San Francisco's most effective bicycle advocacy organization!